This Autumn Kale Salad recipe is the salad of the season! 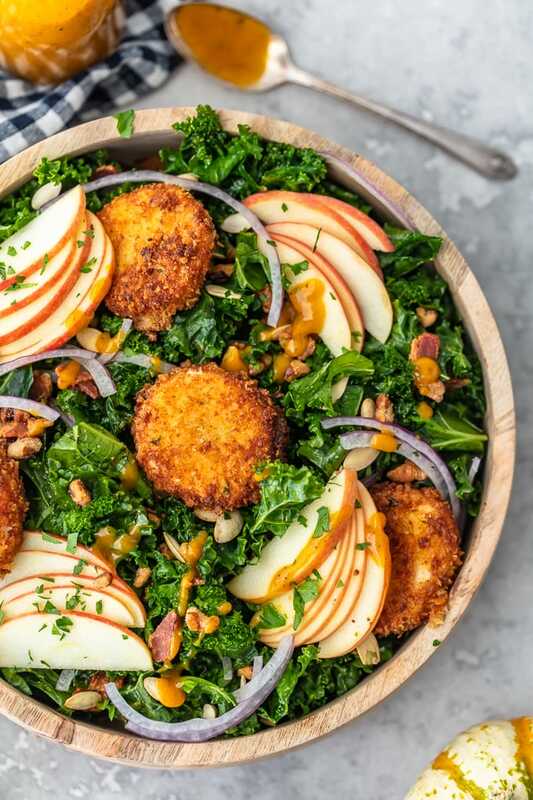 Made with kale, apples, onions, pumpkin seeds, bacon, fried goat cheese and a maple pumpkin salad dressing, it is the perfect fall salad idea. 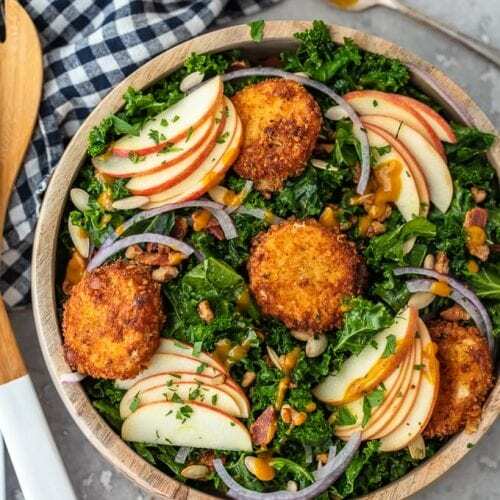 This delicious kale apple salad makes a tasty and healthy meal you’ll want to eat all season long! This seasonal kale salad recipe is the perfect fall salad idea. 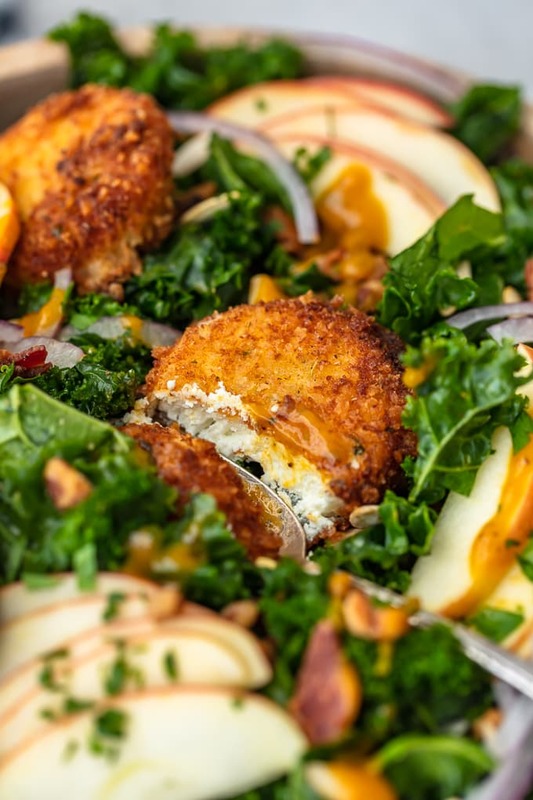 Kale, apples, fried goat cheese & more tossed with a maple pumpkin autumn salad dressing. Yum! I’m not usually one to rave about salads, but this kale salad recipe deserves all the praise. I wanted to come up with some tasty fall salad ideas to honor the season, and all of the ingredients in this seemed like the definition of autumn: kale, apples, maple pumpkin dressing, pumpkin seeds. Of course I had to throw them all together to create the perfect autumn salad! 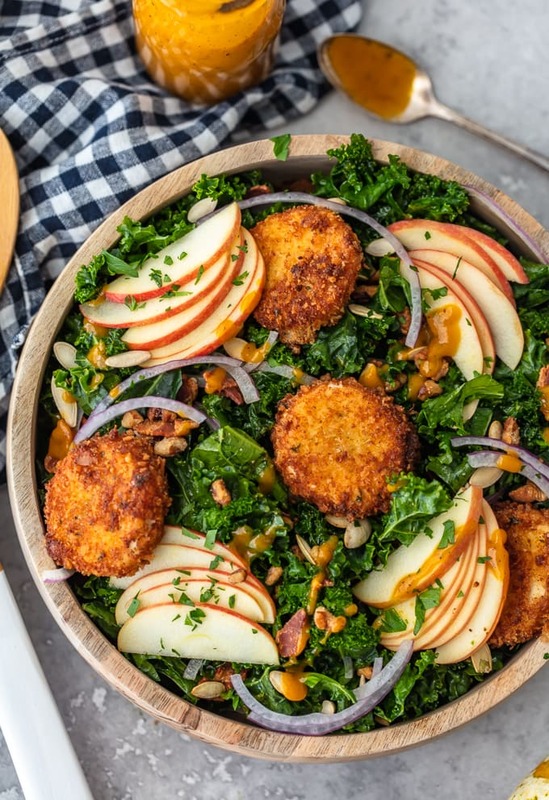 There are a few things that makes this kale apple salad truly amazing. Everything tastes SO good together, and every ingredient is important. But I do have some favorites. Mostly it’s the fried goat cheese discs served on top of the salad, because FRIED CHEESE. I may be eating a healthy salad, but I still want my cheese! 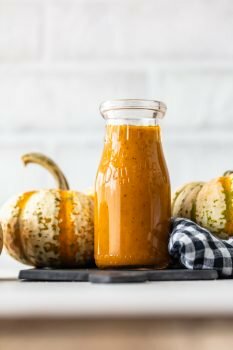 And the homemade maple pumpkin dressing is the perfect kale salad dressing of the season. Maple and pumpkin mixed together? It’s such an amazing flavor combination, with just the right balance. This Autumn Kale Salad recipe works as a side salad to serve with dinner, but it also works as a meal on its own. With all of the hearty ingredients, it’s plenty filling and definitely full of nutrients! Celebrate the season with this Autumn Kale Salad recipe. Filled with apples, bacon, onions, pumpkin seeds, and more, it’s the perfect fall salad idea! With every season comes different flavors and ingredients. The best food reflects the time of year, so this autumn we need some great fall salad ideas! This kale salad recipe is exactly that. Kale is a hearty green with substance, apples are fresh and crisp this time of year, the toasted pumpkin seeds are a great representation of fall, and it’s all topped off with a maple pumpkin salad dressing. It’s the perfect mix of autumn flavors, and it brings a real warmth to the stomach. 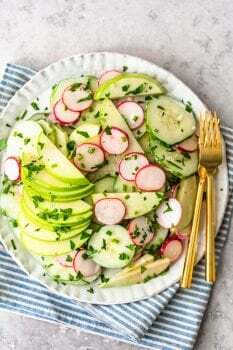 I love this autumn kale apple salad for a nice lunch, because it’s not only delicious, but it’s also filling and full of nutrients! This kale salad recipe is soooo good. Filled with kale, apples, onions, bacon, pecans and toasted pumpkin seeds, it’s undeniably delicious. But the fried goat cheese is what REALLY makes it amazing for me. It takes it from tasty side salad to full on meal. I love goat cheese because it always adds something special to any recipe, and it’s extra delicious fried up in breadcrumbs. It adds the perfect texture into this fall salad! This kale salad recipe wouldn’t be complete without the perfect kale salad dressing! To finish off this fall salad, we’re using a homemade maple pumpkin salad dressing. It’s a blend of pumpkin puree, cider vinegar, maple syrup, olive oil, Dijon mustard, and herbs & spices. 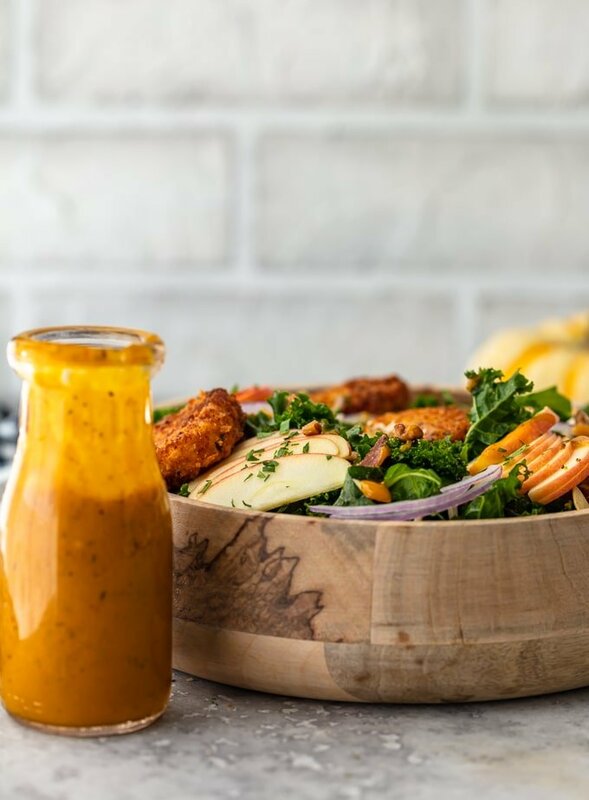 This dressing goes so well with this kale apple salad! You can find the full recipe for this autumn salad dressing here. This fall salad recipe has a few different components, but overall it’s still an easy thing to throw together. Make the kale salad dressing first, so you can store it in the refrigerator and have it ready when you make the salad. Next, work on the fried goat cheese discs. You’ll need to freeze and cut the goat cheese starting about 30-45 minutes before frying it, so keep that in mind when preparing. Then it’s time to put everything together and finish off the kale salad! After washing and preparing the kale, place it in a large bowl. Drizzle on a small amount of the maple pumpkin dressing and massage it into the kale. Add half the apples slices, crisped bacon, pecans, and toasted pumpkin seeds in, and gently toss the salad. Place the remaining ingredients on top before serving. I recommend serving the kale salad with one fried goat cheese disc per person, along with a side of the dressing to drizzle on. Check the recipe card for full instructions for the salad and to see how to make the fried goat cheese. 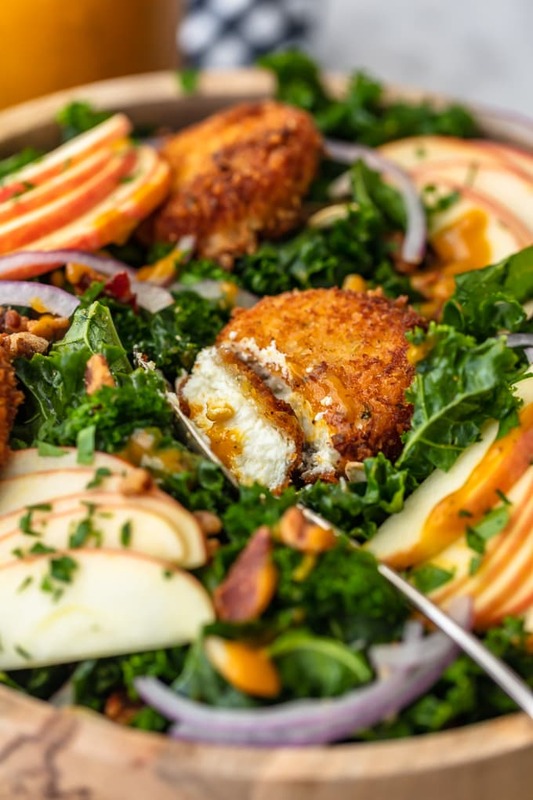 This kale salad recipe is the perfect fall salad, complete with apples, fried goat cheese, and a maple pumpkin autumn salad dressing. It’s so delicious, so festive, and healthy too! 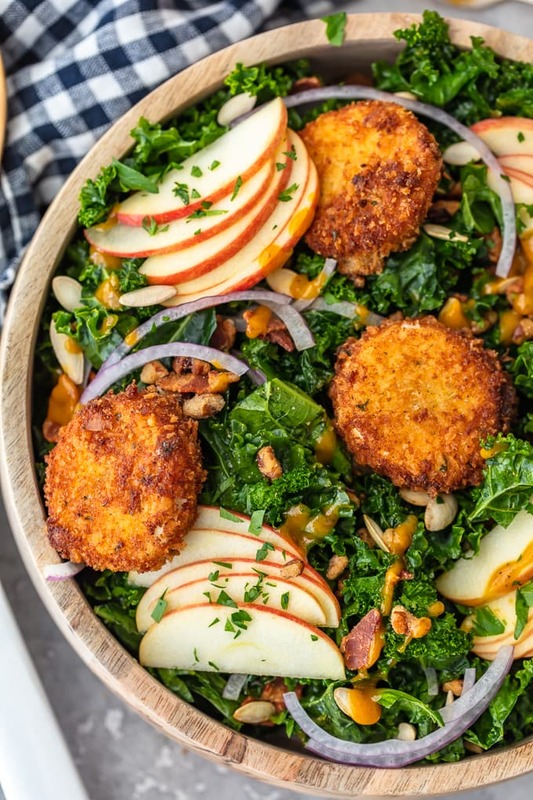 I know you’re going to love this kale apple salad, and I can’t wait for you to try it. Get ready to fall in love with a salad! See the recipe card below for details on how to make this Autumn Kale Salad Recipe. Enjoy! This Autumn Kale Salad recipe is the salad of the season! 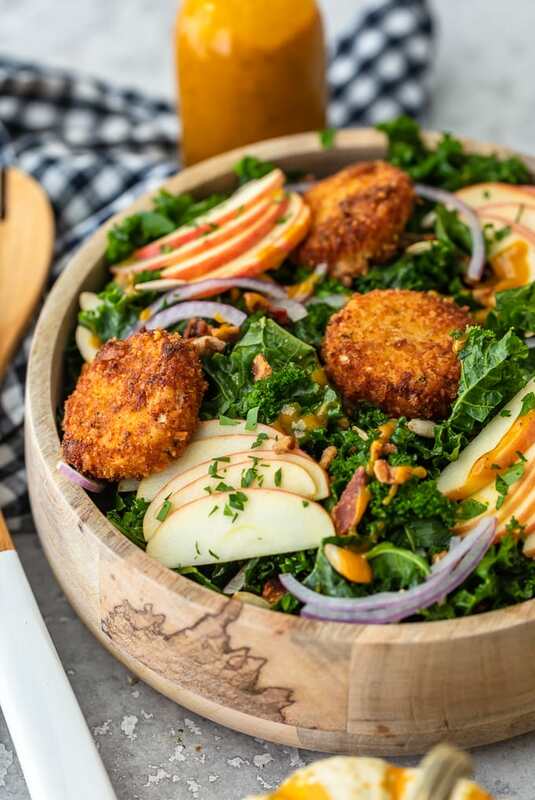 Made with kale, apples, onions, pumpkin seeds, bacon, fried goat cheese and a maple pumpkin salad dressing, it is the perfect fall salad idea. 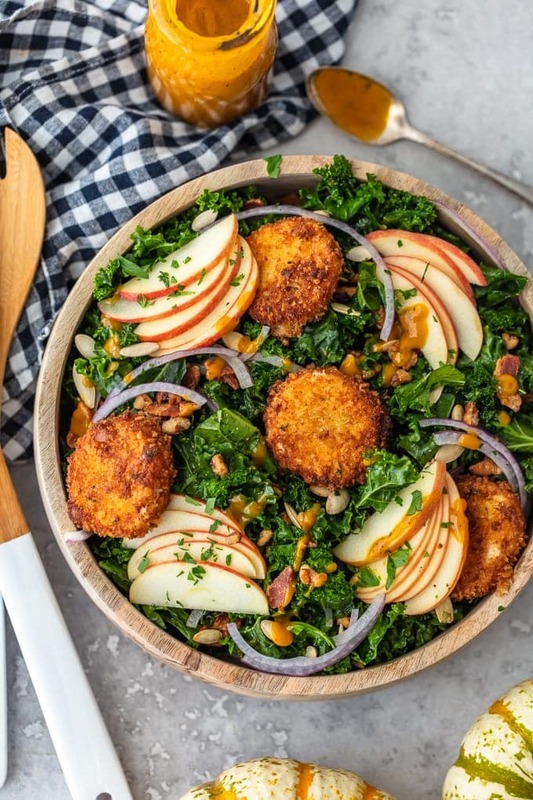 This delicious kale apple salad makes a tasty and healthy meal you'll want to eat all season long! Freeze the cheese log 20-30 minutes before cutting. Line a small baking sheet with parchment paper and spray the paper with non-stick cooking spray. When the cheese is cold, use floss to “cut” the log into ¼” rounds and, if necessary, reshape the cheese slices into smooth circles. Place the cheese rounds on the parchment-lined baking sheet and place in the freezer 10-15 minutes before frying. When ready to fry, pour enough oil in a small, heavy-bottom pan/skillet to come halfway up the cheese circles. Heat the oil, over medium heat, to 340°F-350°F. Place the flour, the eggs whisked with water and the Panko in separate bowls and set the bowls next to each other. Press a cheese round in the flour (both sides), then in the egg/water mixture and then in the Panko breadcrumbs. Place it in the hot oil, and, once the bottom, pan-side of the round is crispy and golden, turn the cheese over to fry the other side. Repeat with all cheese rounds, working in batches, until all are fried. Transfer cooked rounds to a paper towel-lined plate and set aside. Place the prepared kale in a large bowl and drizzle with 2 tablespoons Pumpkin Maple Dressing. With clean hands, gently massage the kale with the dressing, for a few minutes, until each kale piece is coated and has softened just a little. Add half the apples, half the bacon, half the pecans and half of the pumpkin seeds. Top with the remaining half of each ingredient. Serve with one Fried Goat Cheese disc per person and extra Pumpkin Maple Dressing (on the side).